Good morning\evening or whatever suites your timezone :). I’ve been waiting for this :D!, I’ve finished programming the alpha release of the game. The reason I’m publishing it right now is because It might take me some time to have a full game, so by publishing an alpha release I can get opinions & suggestions from people which will encourage me to complete the game. This release isn’t meant for end-users but rather for fellow programmers. You cannot render to more than one render target using one draw call. Problems when rendering textures or using render targets that dimensions are not powers of two. Indices in any IndexBuffer must be 16 bits integers. Space – Jumps ( not actually jumping hahaha 😀 ). R – Reloads the active gun. G – Replaces the current gun with the one on the ground. Move mouse while holding the right mouse button to change robot direction. Left mouse button – Fires from the active gun. Holding the left mouse button will charge the weapon if it’s chargeable, to fire release the button. Tab – Shows score board. Each robot can hold two weapons, one on each arm, you can only use on weapon at a time. One bug that really bugs me is this : if the game is running slowly (low fps) the arms of the robot start to shake from left to right :(, I’m not sure yet about the reason, but I really must fix this in the next release. Another issue is aiming when the screen resolution is wide: enemies at the left\right edge of the screen cannot be reached. 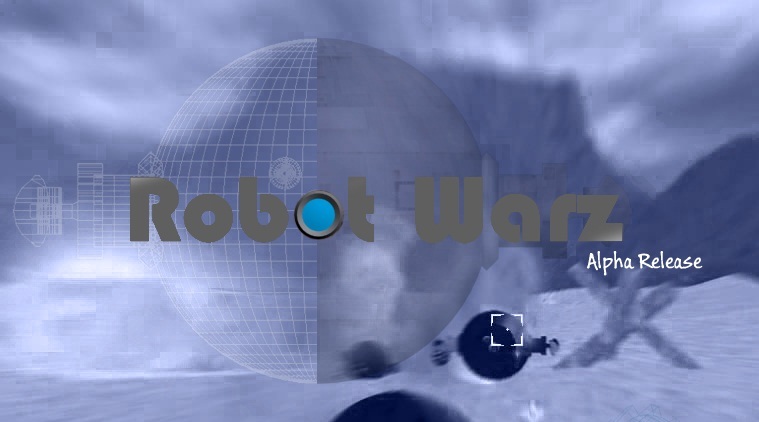 please use the RobotWarz Launcher.exe to run the game. This game was a graphics project for college, they demanded that projects should be done using OpenGL (I hate OpenGL 😦 ), so I decided to take my chances & use XNA, the interview went ok but only after a long argument 😀 . Terrain was completely programmed by my colleague Hashem Al-rifai, this terrain is infinite, and it uses a quad tree algorithm to render only the visible parts of the terrain. All the models in the game are mine :), They were simple enough for me to model them myself using 3DS Max. The sound effects in the game aren’t mine & I intend to replace them in the next release, I was in a hurry before the project interview so I picked the sounds from free sound effects websites, most of them don’t fit :(. One dark secret about the floating robots is that right now I don’t know how the hell should I animate legs :(, I don’t want to use md2 model format. anyway, floating robots are cool :D.
Why isn’t network playing supported? Right now I have no networking skills, also keep in mind that networking in games is different from desktop applications that use networking, you have to sync everything between the server & the clients, prevent cheating & more complicated stuff. The game will be much more fun if networking is enabled. Any way I’ll see what I can do. I guess I’ve talked too much. I’ll try in the next days to explain some of the techniques used in the game, I maybe write some short tutorials on that. Feedback is always welcome :). Thanks :), I really appreciate it :). I defined settings (Screen Resolution and …) but it didn’t start, with no error message ! You tried both HiDef & Reach and none of them worked :(? Do you have XNA4 Redistributable installed?